Everyone’s Welcome at the Dismal Swamp! Once again, Brian and I decided to transit the Dismal Swamp Canal portion of the Intracoastal Waterway (ICW). This canal was the original ICW; now boaters may choose to transit via the Dismal Swamp Canal or the Virginia Cut. The Dismal Swamp Canal is beautiful, serene, and offers several free docks for transiting boats. During our October 2013 southbound transit, Brian and I spent three days in the canal exploring between the Deep Creek and South Mills locks. There is much history here, and abundant wildlife to enjoy. This year while transiting northbound we stopped once again at the Dismal Swamp Canal Welcome Center’s dock. The Dismal Swamp Welcome Center is located five miles north of the South Mills Lock. The 150′ dock has ample space and strong pilings on which to secure dock lines. Do visit the Welcome Center and sign-in. For our landlubbing friends, the Dismal Swamp Welcome Center provided a spectacular meeting place. By road, the Welcome Center is located on US Hwy 17N in South Mills, NC just three miles from the North Carolina/Virginia boarder. Free docking and plenty of parking! Visitors can walk across a foot bridge over the canal to visit the Dismal Swamp State Park on the opposite side. The State Park has a wonderful visitor’s center and many trails for hiking and biking. The eb and flow of travelers through the Welcome Center offered wonderful opportunities to meet travelers. When we first arrived, there were two other sailboats docked. Both were southbound, running from the cold, and we were excited to share our experiences with one another. We also met a woman returning home by car. She walked the dock with her dog, and stopped to chat with us; we found common interests in boating and traveling. The next morning. We had a lovely conversation with a couple who shared our enthusiasm for travel, however, preferred reaching their destinations at a more reasonable (fast) pace and so traveled by car throughout the United States. 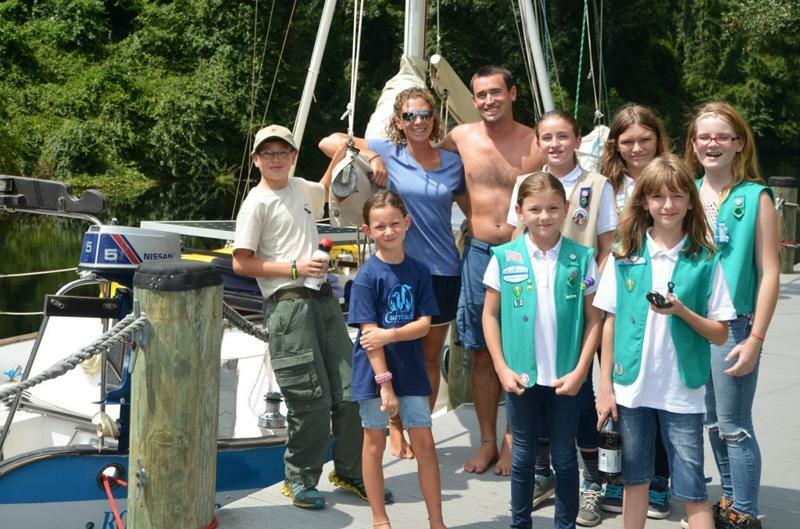 Later that afternoon, we greeted Danielle, Russ, Ian, Willow, and to our surprise Girl Scout Troop 52. The Scouts were visiting the Dismal Swamp State Park for an afternoon of orienteering. Brian and I welcomed the children aboard Rode Trip for a tour. They had so many wonderful questions! Since they were orienteering, we showed them our compass and explained how we use the compass to navigate on the water. Down on the cabin, I turned on the fish finder/depth sounder and we studied the screen for passing fish, checked the depth, and water temperature. I explained how we carry our own fresh water aboard wherever we go, how we shower, and yes even a quick tutorial on the composting toilet (to which one of the girls replied, “EEEWE!” I shared some of our beach treasures with them, sand dollars and sea biscuits. We even watched some of Rode Trip’s video clips of sea animals that we have encountered. Such fun! This entry was posted in Uncategorized and tagged aicw, atlantic intracoastal waterway, Dismal Swamp, Dismal Swamp Canal, dismal swamp welcome center, great dismal swamp, ICW, Intracoastal waterway, pirate, pirate ship, pirates by stephanie. Bookmark the permalink. Oh my goodness, the scout leader must have thought they had died and gone to heaven!! That is SOOO cool! !